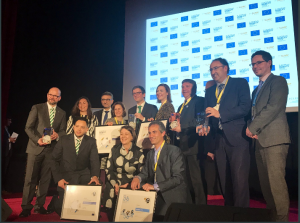 On March 21, the European Commission has announced the winners of European Mobility Week Award 2018 and the 7th Award for Sustainable Urban Mobility Planning (SUMP). Lisbon was revealed as the winner of the European Mobility Week Award 2018 for larger municipalities, with Lindau taking home the award for smaller municipalities. The 7th SUMP Award was won by Greater Manchester. “I would like to sincerely congratulate the winning cities, all of whom carried out inspiring activities to promote sustainable urban mobility. They are true examples of how local leaders across Europe are combining different modes of transport as a means to make our cities cleaner, safer and more sustainable,” Commissioner for Transport Violeta Bulc said. Lisbon, Portugal, home to over half a million people, impressed the jury with its strong vision for a more sustainable mobility culture. During the European Mobility Week 2018, residents could use take their bike on board a train for free, giving them a real incentive to try out multimodality. The city also organised museum bike trips, free bicycle repair workshops, and a special prize for people and organisations that promoted the use of bikes. Lindau, Germany, placed significant emphasis on multimodality. To communicate the benefits of ‘mixing and moving’, on-street info points were set up where people could learn about making smarter mobility choices. On Car-Free Day, a free hybrid shuttle bus and water taxi were provided, in addition to residents gaining free access to the newly expanded car-sharing service. Lindau recently installed almost 500 new bike racks at train stations and bus stops, making it easier to cycle to and from public transport. Greater Manchester, United Kingdom, has set ambitious multimodality goals, which it intends to reach using a wide-range of integrated and combined mobility options. The jury was particularly impressed by Greater Manchester’s use of smart, new technologies to increase the share of journeys made using sustainable modes of transport. As part of its mobility planning approach, Manchester considers each part of the city individually, according to its size, location and function. Measures are then adapted to the needs of the area.